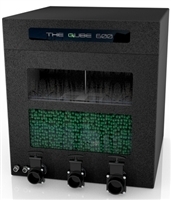 The Qube system, which incorporates the Orbs Media Technology, is a new stylish range of sealed bio-reactors capable of both solid capture and bio-filtration. The filtration units have a unique bio-mechanical stage, capturing large solids before they get into the main biological stage. This reduces the need for excessive backwashing of the filter media. The Qube works by removing waste and harmful toxins, such as Ammonia and Nitrite, and converting them into less harmful Nitrate. The systems also eliminate any bad odours and prevent the build-up of Hydrogen Sulphide gases (common in conventional filters). With its self-cleaning system, indoor location of the filter can be taken to a new level. There are several different models to suit every need, all of which rely on the same technology and utilise low-wattage pumps for maximum energy efficiency. The Qube, by design, is arguably the most eco-friendly and cost efficient system currently available, by offering a highly efficient power source and thereby, significant savings on standard running costs. The unique technology utilised by The Qube means a reduction in footprint size when compared against other products in processing the equivalent volume of water. The Qube has been carefully designed to run with very low operating noise and significantly less than other types of system. O.R.B.S. Technical Info. The ORBS are a completely new generation of filter media. ORBS feature advanced design and materials technology for optimum filtration performance. This design ensures they don't become blocked so that the entire surface area of the media is always available for bacteria growth. The ORBS media use technology with a unique design and surface area that makes them up to 80% more efficient than other leading plastic filter media. Unlike other media, the surface is grainy, not smooth. this grainy surface is ideal for the nitrifying bacteria's nitrosomonas and nitrobacter to secrete their sticky slime matrix. Once colonised, the dense bio-film is more resistant to cleaning, which in turn accelerates the biological process. ORBS also have EVP's (External Void Protectors) around the centre of the sphere. These create void space, which allows water to flow effortlessly. The Bio-Reactors have an enormous nitrification capacity and can easily cope with heavy organic loadings. ORBS are totally inert making them chemically resistant and safe for use in aquatic environments. The Qube 300 - Pump Fed. 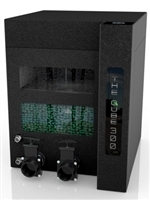 The Qube 300 - Gravity Fed. Dimensions: H 255 x W 210 x D 210mm. Ideal for quarantine tank or small pond. Dimensions: H 395 x W 310 x D 310mm. Ideal for attaching to a surface skimmer (removes DOC), quarantine tank or small pond. The Qube 400 - Pump Fed. The Qube 400 - Gravity Fed. The Qube 400 Plus - Pump Fed. Dimensions: H 555 x W 460 x D 460mm. Ideal for average sized ponds. The Qube 400 Plus - Gravity Fed. The Qube 600 - Pump Fed. The Qube 600 - Gravity Fed. Dimensions: H 710 x W 660 x D 660mm. Designed with 2 x 25W UV units incorporated. Ideal for medium sized pond up to 6000gals. This unit is shipped directly from the manufacturer. Pallet delivery price to Ireland is included. The Qube 800 - Pump Fed. The Qube 800 - Gravity Fed. Dimensions: H 855 x W 810 x D 810mm. Ideal for larger sized pond up to 10,000gals.